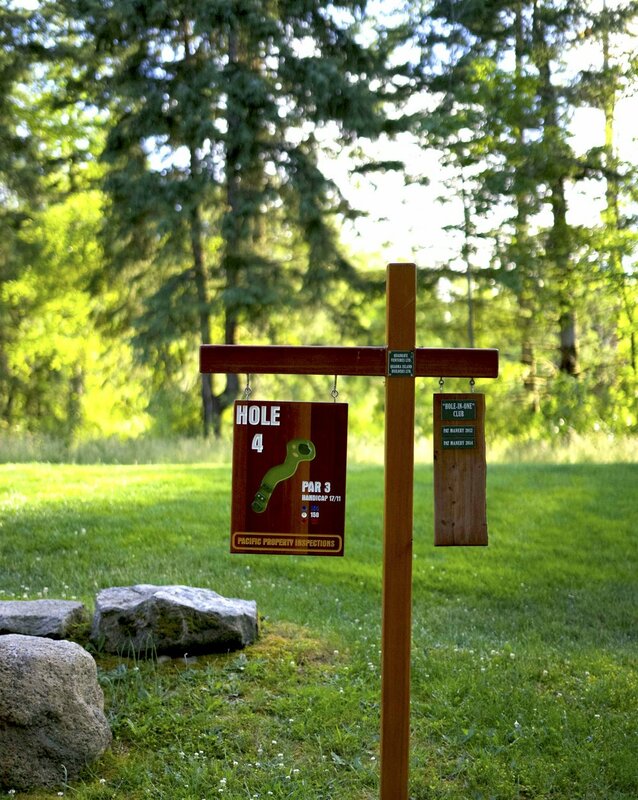 You are greeted at our opening hole by Smiling Rock. Give it a pat for good luck! 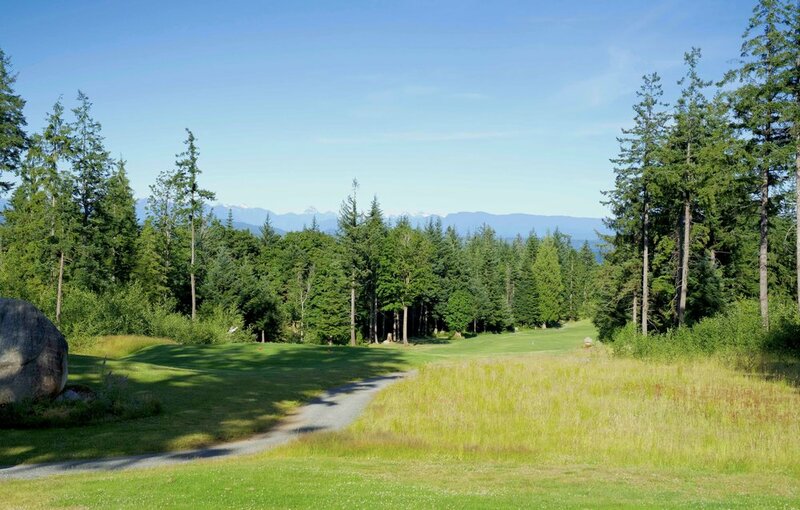 This downhill dogleg right plays down towards views of the mainland mountains and Cortes Island... don't let the setting distract you! Pro Tip - Longer hitters may not need driver off of the 1st tee as it is possible to hit through the fairway on the left hand side of the hole. Playing a teeshot just inside the 150 yard marker will leave you a great approach to this back to front sloped green. This par 4 is a journey into solitude. A well placed drive takes you to the corner of a dog leg right that will reward you with a theatrical view of the green and it's surroundings. Pro Tip - This par 4 plays more downhill than it looks. Similar to #1, the left side trees are reachable from the teeing ground. Select an appropriate club to position yourself in the centre of the fairway. A left to right teeshot flight will cut down the length of this challenging hole. 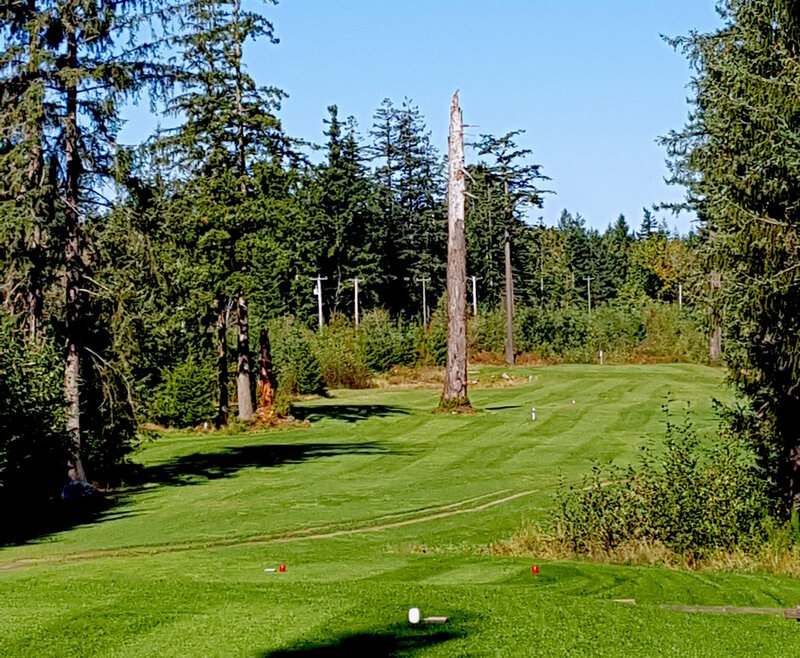 The tees for this uphill par 5 are set among Sitka Spruce. The varying widths of the fairway make it necessary to chose your landing areas carefully. Be precise with your approach to this two-tiered green as anything short will roll back down the steep slope. Pro Tip - The landing area off the tee is wider than it appears. Keep your second shot to the left hand side of the fairway in order to setup the best approach angle to this elevated green. 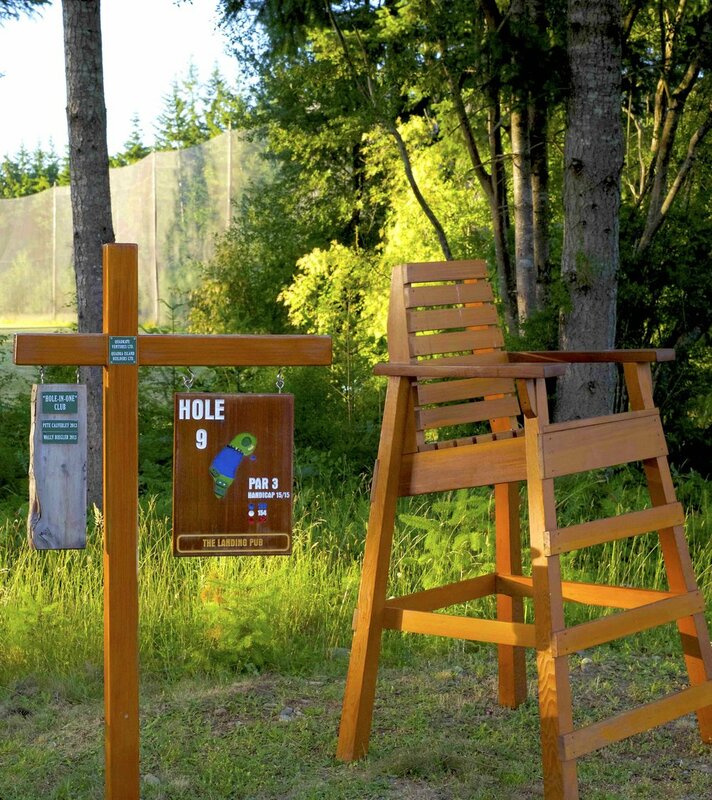 Be aware of the hazard that runs on the right side of the hole from 150 yards up to the green. While looking deceptively easy, this par 3 plays into a long, narrow green guarded short and left by two pot bunkers. The green is shaped to present a variety of challenging putts. Pro Tip - Be sure to use the appropriate club based on flag location as this green is quite deep. It's also on an angle, so play towards the "forgiving" side of the flag stick. This beautiful Par 5 is the number one handicap hole. It's an uphill beast rising over 100 vertical feet! 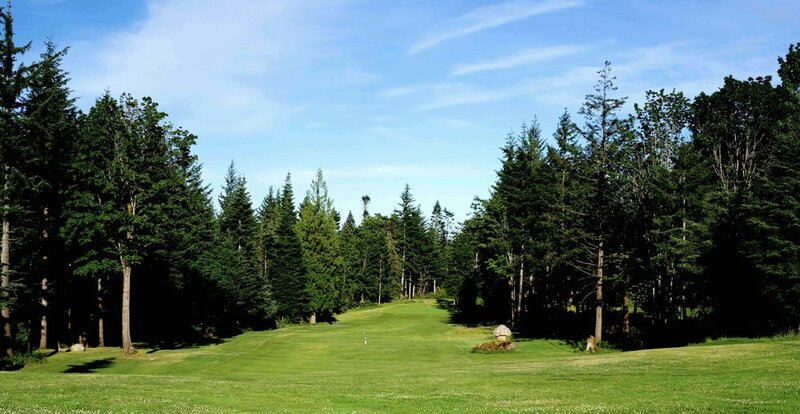 There is a strand of fir trees just short and left of the green which makes approaches from the left side very challenging. Before you leave the green, check out the view over Sutil Channel to the Coast Mountains. 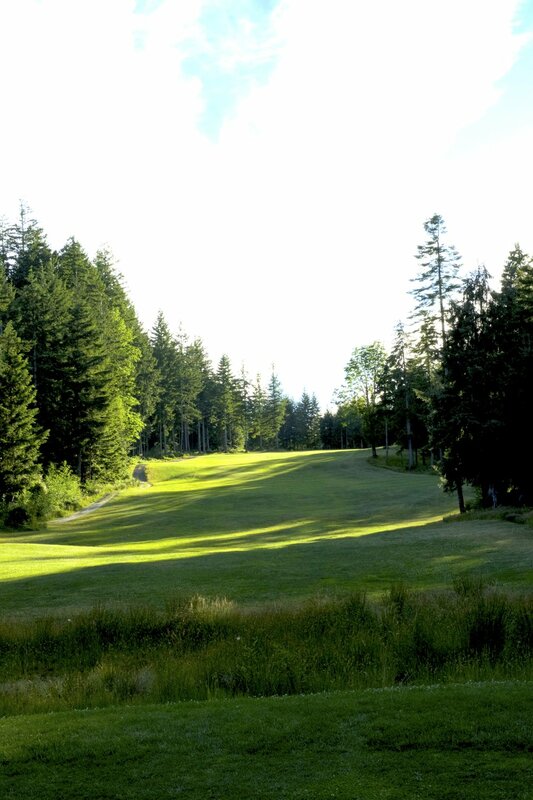 Pro Tip - From 150 yards and in, you will want your ball to be on the right hand side of the fairway as to avoid the large fir trees with your approach. Be sure to take an extra club to compensate for the elevation. This is another long, narrow green. An elevated tee with a clearly visible green and a generous fairway provide an opportunity for long hitters to stroke their egos. Beware of the creek that crosses the fairway about 50 yards in front of the green. Pro Tip - Playing your teeshot down the left hand side of the fairway will give you the best approach angle. If you find yourself down the right side, you can potentially be blocked out by a grove of trees situated just over the creek. 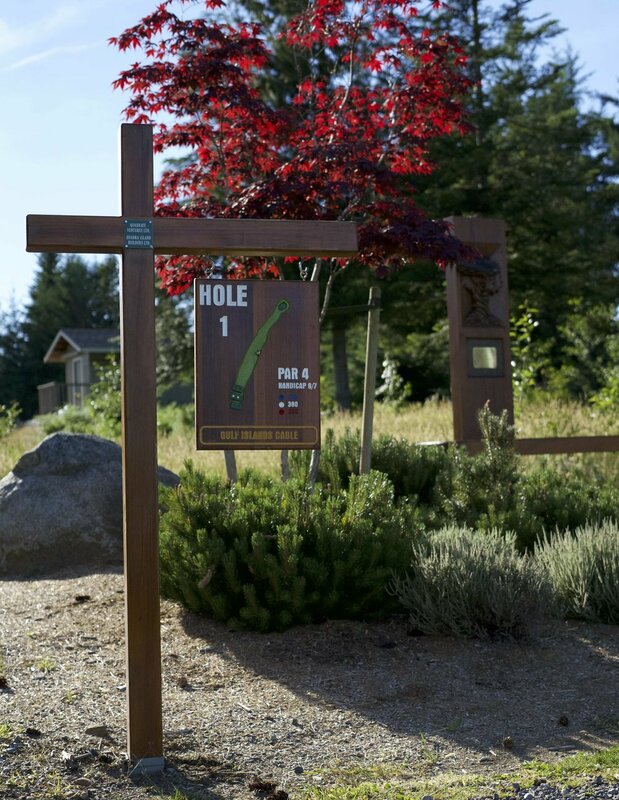 Enjoy the scenic path at the edge of the natural wetland on your way to the seventh tee. This is a straight par 4 with tiered landing areas. A fairway bunker guards the right hand side of the fairway about 150 yards from the green. Take care to avoid the large stone in the middle of the fairway just short of the green. Pro Tip - This hole plays much longer than the scorecard reads as the green sits 75 vertical feet above the tees. Be sure to take one or two extra clubs on your approach shot. The green is protected by a false front and is wide, but only 15 yards deep. Hole number eight is a par 4 that is accented by a large snag habitat tree that splits the fairway about 210 yards from the green. Beyond the snag, the fairway opens generously to either side. Precision is required on your approach to the green as it is guarded left and right by ponds, and two bunkers over the back. Pro Tip - Grip it and rip it at either side of the snag tree in the middle of the fairway. Approach shots played from the right side of the fairway are favorable as there is less water to navigate. This is our smallest green, so be accurate! The serene beauty of this, our signature hole, is deceiving. This par 3 requires all of 160 yards carry to clear the deep pond from the back tees. 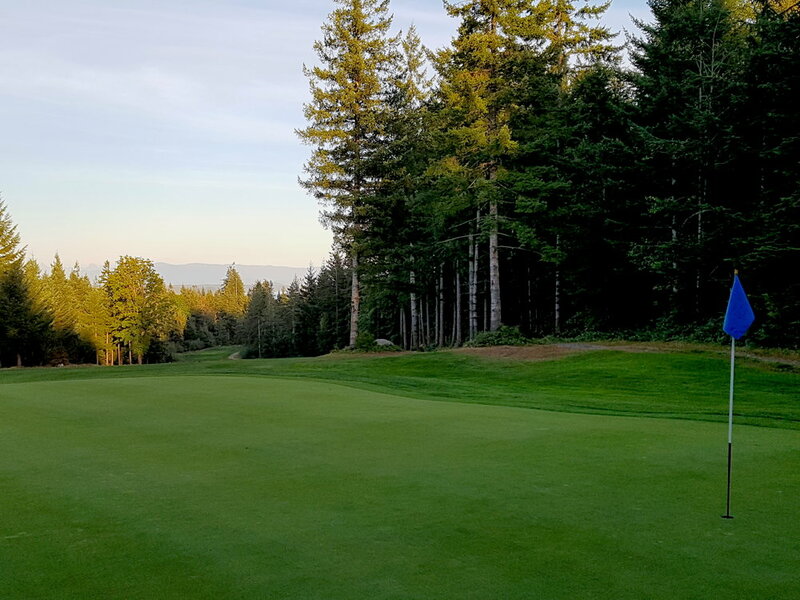 Protected by a pair of fir trees to the left of the green and a bunker to the right, par is an accomplishment anytime. What a way to finish! Pro Tip - This hole plays deceivingly long as it is more uphill than it appears. Beware the right side... not only is there the deep bunker bordering the fringe, but also a hazard that extends from the pond all the way up that entire side.